After three years of battling difficult weather conditions at the Wendover, Utah, Bonneville Salt Flats track, The Ohio State University’s Venturi Buckeye Bullet 3 student team and driver Roger Schroer rallied to push their electric streamline vehicle to a world record two-way average top speed of 341.4 miles per hour (549.4 kilometers per hour) on Monday, Sept. 19, 2016. The Venturi Buckeye Bullet 3 (VBB-3) shattered the previous world record of 307.6 mph (495 kph), set by the Ohio State-Venturi team in 2010. The new world record is pending certification by the Federation Internationale de l’Automobile (FIA), the worldwide motorsports governing body, in Category A Group VIII Class 8. 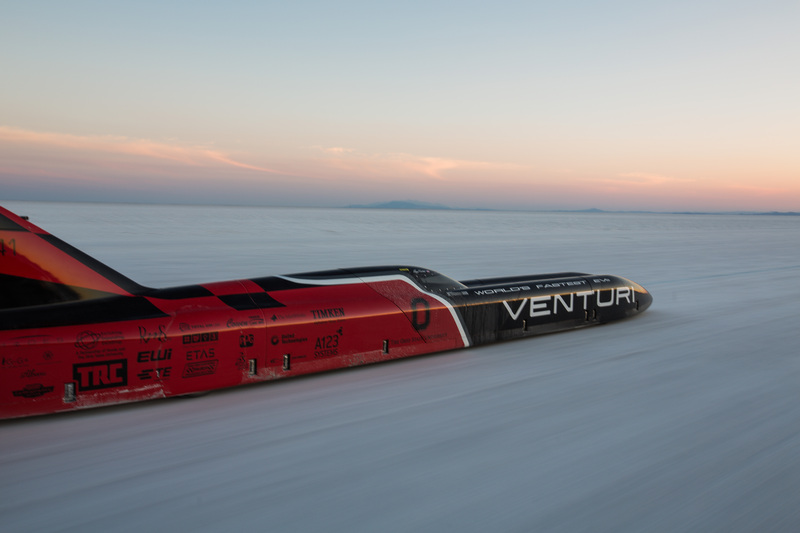 In the middle of this season’s first record-attempt run, the VBB-3 reached a top speed of 358mph (576kph). However, FIA certification is based on the average speed of two runs, made in opposite directions and within 60 minutes. Eleven miles of pristine track – a dry, compact layer of salt – and clear, sunny weather produced the perfect setting for this year’s record-setting runs. A core group of 10 undergraduate and graduate students at The Ohio State University Center for Automotive Research, in partnership with Monaco-based electric vehicle manufacturer, Venturi Automobiles, spent the last six years designing and building the electric streamliner. Venturi lends its expertise in electric vehicles and significant sponsorship funding to the students. The record-setting car is propelled by two custom electric motors developed by Venturi Automobiles, and is powered by over two megawatts of lithium ion batteries produced by A123 Systems. The vehicle was piloted by Roger Schroer, veteran team driver from the Ohio State affiliated Transportation Research Center, the nation’s leading independent automotive proving ground and vehicle testing organization in East Liberty, Ohio. The Venturi Buckeye Bullet 3 is the latest iteration in a series of electric racing vehicles built at Ohio State’s Center for Automotive Research, which has a 22 year history of electric racing. In 2004, Buckeye Bullet 1, which ran on nickel metal hydride batteries, set a national land speed record with an average time of 315 mph (506.9 kph). Venturi Buckeye Bullet 2, the world’s first hydrogen fuel cell-powered land speed electric vehicle, set the international record of 303 mph (487.6 kph) in 2009. The mission of the Buckeye Bullet team is to provide unique engineering challenges for students. The team strives to provide valuable, hands-on experience, creating some of the best young engineers in the world. The goal is to promote and represent sponsors professionally and with integrity, aiming to bring together great minds and new technologies to overcome the most difficult challenges. This student team, located at the Center for Automotive Research, pushes the envelope of electric vehicle technology and in so doing hope to change public perception of electric vehicles. Mission: prove that green technologies of the future will be both fun to drive and fast! More: go.osu.edu/VBB3. Follow the team on Twitter at @OSUCtrAutoRsrch and @buckeyebullet3; Facebook and Twitter using #VBB3. Venturi Automobiles was founded in 1984 in France as a sports car manufacturer. Purchased in 2000 by Gildo Pallanca Pastor, it focuses on innovation in the field of electric vehicles by harnessing the most advanced technological solutions in this area. Venturi expertise extends from urban cars to high-performance vehicles. Founded in 1870, The Ohio State University is a world-class public research university and the leading comprehensive teaching and research institution in the state of Ohio. With more than 66,000 students (including 59,000 in Columbus), the Wexner Medical Center, 15 colleges, 80 centers and 175+ majors, the university offers its students tremendous breadth and depth of opportunity in the liberal arts, the sciences and the professions.